Jeffrey Adams, first OEF/OIF vet to get a CCI service dog, with Sharif, his CCI dog: image via allbrittain.com The Marine Corps base at Miramar in San Diego, CA has an innovative program for inmates of its brig. Those prisoners who qualify for the program get to train service dogs that later give their service to 'fellow' Marines wounded in combat. The dogs end up being of service to both the prisoner and the combat vet. The inmate trainers,screened by clinical services staff at the brig, say that the hardest part of the program is letting the dogs go after 18 months with them. But while caring for and training service dogs, the prisoners receive many benefits too. They get more discipline, learn patience, and anger management. 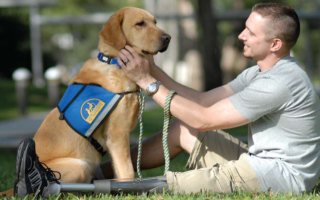 As they train the services dogs to gather necessities and to perform household tasks for their eventual disabled owners, they also learn selflessness.